Tesco's chief executive has told a court of his "genuine shock" on learning of the £250m overstatement of the company's profits. Dave Lewis told Southwark Crown Court he had "no indication at all" of the issue until brought to his attention by the supermarket's legal department. He was giving evidence in the trial of former Tesco directors. The men deny one count of fraud and another of false accounting, and are on bail. 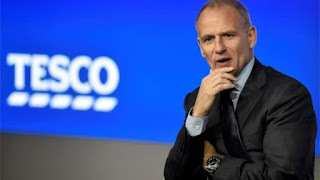 Tesco's shares tumbled by nearly 12%, wiping £2bn off the value of the company, when Britain's biggest supermarket announced in September 2014 that the previous month it had overstated profits by about £250m. Mr Lewis said his initial reaction to learning about the overstatement was "one of genuine shock, the level of what was implied in the paper was a way of operating I had not ever seen before".